Hazrat Hassan Murchie Sahib D.B. of South Africa is the first man to introduce the Braille Quran to the Indian Subcontinent. Hazrat has studied at Darul Uloom Falehe Darain, Tarkesar, Gujarat. After that, he started a Madrassa for Blind people, " Madrassa An-Noor for the Blind" in Cedara. Not only that, he created a movement by working towards our innocent Muslim brothers in Christian missionaries. Many Muslim brothers are converted, in the name of education. Ten years ago, not a single page or any verse of Islamic books were available for Blind people of India. Our Teacher, Hazrat Hassan Murchie Sahib started this movement. Hazrat is the founding member of the reputed Madrassa for Blind people in Pietermaritzburg. Students from all over the world come here for education. Moulana Visited India in 1994 and conducted a workshop in Braillle at Jamia Islamiah Jaam Nagar, Gujarat. After that, he conducted the first Braille Quran conference in Ahmadi School for the Blind, Aligarh. Moulana is working tirelessly in this movement. The movement reached new heights when the founder of Idara E Deeniyat Fine Touch-Mumbai, Janab Rafeeq Bhai Doodhwale adopted this. They took upon this mission. 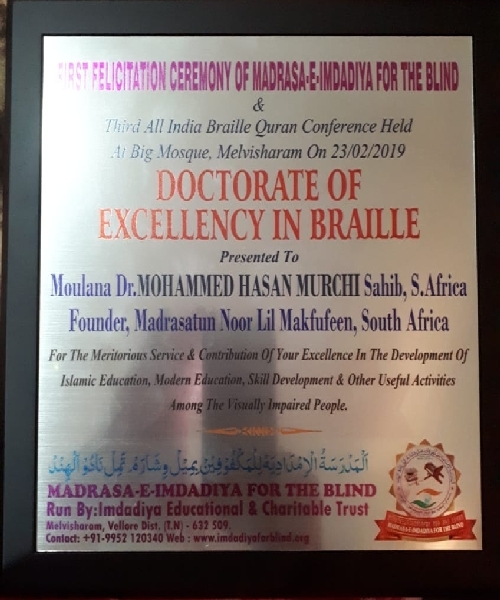 Alhamdulillah, Maktab's and Madrassa for the Blind people are now situated in many parts of the country like Kashmir, Calcutta, Ahmedabad, Mumbai, Jalgaon, Latur, Bangalore, Hyderabad, Melvisharam, Kerela and Aurangabad, and Pune.